In August 2003, I was 8 years old and my teenage cousin introduced me to her new computer game. I was hooked immediately. For the rest of that summer, I always made a beeline to her computer and eagerly loaded the game to resume where I had left off. This special game was the first installment of The Sims. Embellished by its quirky expansion packs, The Sims remains one of the best-selling game franchises in contemporary culture. Growing up, it was hard to meet someone who wasn’t already aware of it. With the ability to create neighborhoods and houses, then fill them up with people of your own design, the game allows for endless possibilities. Watching the people I’d created grow, achieve goals, fulfill their needs, and interact with one another brought me great delight as a child. I was constantly brimming with creative ideas, always fond of dreaming up characters and imagining narratives. I’d craft storybooks complete with illustrations and blurbs, but I’d never channeled my hyper-creative energy into a digital format. The Sims felt like finding treasure. It was a revolutionary type of game, where there was no real “winner” or end goal. The player could create narratives and imaginative scenarios to their heart’s content. For those familiar with the sight of the distinct emerald green Plumbob from The Sims universe, the cultural influence and legacy of the “virtual dollhouse” life simulation game is simply irrefutable. In the 18 years since the release of the first Sims, the franchise has sold nearly 200 million copies worldwide, claimed 80 million current players on PC and mobile, and spawned four major installments, dozens of expansion packs, quirky Simlish phrases, a memorable repertoire of iconic upbeat theme music, and more. 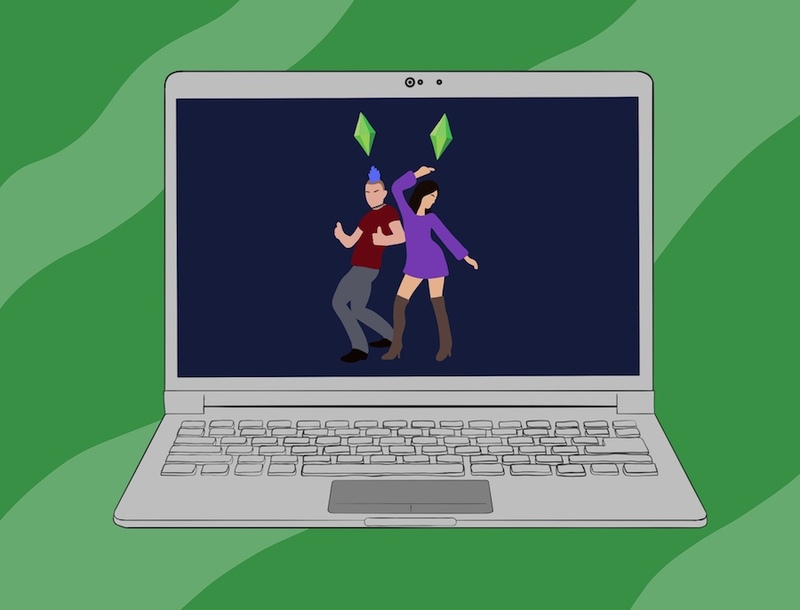 The global impact that The Sims has left on contemporary pop culture is evident through a burgeoning dedicated YouTube community, numerous Sims-centric forums, references to the game in film and television, influence on costume parties, and even viral memes. However, what has been less discussed is the intriguing and beneficial effect that the game can have on its players’ mental health. In an age when video games are often negatively associated with mental health, what role could a game like The Sims play in the lives of people living with anxiety—people like me? When I learned about the ubiquity of anxiety disorders—a topic rarely discussed in my youth, neither at home or at school—I felt reassured. I was not the only one struggling, and I immediately sought help. I was strongly recommended therapy and counseling as treatment plans, but these didn’t work as effectively as I had hoped. I also tried yoga and Pilates classes, but truthfully, physical activity did little in the grander scheme of my daily struggles with anxiety and panic attacks. But then I returned to the same game franchise that I had enjoyed so much as a child, and found an unconventional way to self-soothe. From the safety and comfort of my own home, I could micromanage my Sims characters, watching them go about their daily lives. Playing the latest version, The Sims 4, also served as a creative outlet in which I could build homes from scratch and experiment with different architectural styles, from wallpaper choices to types of flooring and roofing to furniture design and window placement. It reinstated a sense of control during a time when I felt I had very little control in my real life. I was nearing complete burnout from juggling my rigorous med school studies, experiencing alienation and low self-esteem, and feeling pressure to be the best version of myself in every single way. But for a few moments in the day, I could escape to the intricately carved-out narratives of my Sim families, whose lives I had so neatly aligned and planned out. During the peak of my anxious episodes, my life in the real world seemed like a disorderly mess of doubt and inadequacy; in the artificial Sims world, everything ran like clockwork. For my busy mind, it was a perfect form of escapism. As I engaged more with my creations within The Sims universe, I grew more attached to their individual “personalities” and quirks—and with each expansion pack, I could flesh out their world by adding pets, holiday destinations, and even supernatural species. Gradually, I improved the various skills and talents of my Sims—leveling up their singing abilities by having them use a karaoke machine or enhancing their cooking skills by making them attempt new recipes. I lived vicariously through them, and could delve into my constructed virtual world whenever I needed a mental distraction. Curious about how other people living with anxiety utilize The Sims, I began perusing the Internet and found likeminded players who use the game as a coping mechanism. Among the differing opinions and perspectives of various Sims players, what is seemingly most agreed upon is this idea that The Sims acts as an escapist activity. “Playing The Sims is an escape mechanism and, as such, I imagine that it could be an effective reliever of stress and anxiety,” user FKM100 posted in the same forum. Other players felt that playing The Sims offered an opportunity to create “better” versions of real life. These instances—people not creating purely fictitious storylines, but actively re-creating real versions of themselves, their friends, and family members—resonated with me the most. I had been recreating my favorite film and TV characters, and rebuilding altered versions of my childhood—materializing a “happy” nuclear family, which is a structure that I had lacked. I found that one of the most rewarding aspects of playing The Sims was the creative freedom it granted to fictionalize “everyday” scenarios (one of my favorite current Sims creations is a successful, cat-loving, Carrie Bradshaw-esque writer living in a chic high-rise apartment—I can only dream!). I stumbled upon blogs of other young adults who returned to The Sims in times of stress. I was reassured to learn a college student who lived almost 4,000 miles away shared a remarkably similar experience: What started as her “trip down memory lane” led to her discovery that the game greatly reduced her anxiety levels. Once again, the semblance of choice was incredibly therapeutic: “You get to choose what you look like…your personality traits…and what your career is…[in The Sims] you can be anything.” A separate blog post echoed these sentiments. The lighthearted aspects of the game, such as eclectic costumes and humorous interactions between characters, are enjoyable enough, but The Sims franchise has been repurposed by its community—catering to a niche demographic of players with mental health issues. I’m aware that my experience with The Sims is mainly anecdotal, but I’ve learned that I’m far from a unique case. My anxiety disorder largely hinged from feeling a lack of control and a loss of regimented structure, so this virtual world of escapism and infinite possibilities was entirely beneficial. Nowadays, I tend to limit my Sims-playing to one or two hours on a good week, but I’ll play more if my anxiety levels happen to rise. Finding solace from a computer game was something I never expected to need, but with each visit to my Sims world, I feel calmer than I did before.